Through the centuries, there have been many royal visits to the Archbishops’ Palace in Bishopthorpe. The twentieth century alone has seen a number of royal guests passing through the famous gateway but, as they have been private visits, photographs of the events are few and far between. However, we are lucky that Jill Black, one of our Australian bishdotnet readers, decided to sort through her photo albums and found a snap of Princess Elizabeth descending the steps of the Palace. Jill contacted us to ask which year this could have been. The photograph snapped in 1949 which winged it’s way from Australia. It shows Princess Elizabeth and the Duke of Edinburgh leaving the Palace after taking tea with Archbishop Garbett, who is standing on the left. Having searched through old newspapers, we know that Princess Elizabeth and the Duke of Edinburgh made their first official visit to Yorkshire from 26 – 28 July 1949. The last day of that trip was spent in the City of York looking round the Minster and lunching with the Lord Mayor at the Mansion House. During the afternoon, the young couple, who had been married for less than two years, toured the new Carr Estate at Acomb. From there, they were driven to Bishopthorpe Palace where the villagers were “allowed” to gather within the grounds as far as the clock gateway. The local Brownies, Guides and other children lined the drive waving flags and streamers at the royal visitors. 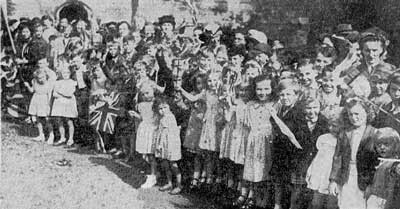 This press photograph of some of the children lining the drive, appeared in The Yorkshire Herald. Does anyone recognise him or herself? The appointment with Archbishop Garbett and his sister was meant to be a quiet, relaxed affair taking tea in the elegant drawing room. The only other guests present were the Archbishop’s private chaplain and secretary. One hour later at 5.30 p.m., Jill Black, who was ten-years-old at the time, watched as her friend snapped Princess Elizabeth taking her leave of the Archbishop on the Palace steps. The Duke can be seen just behind her. It should be remembered that in the years following the war, fewer people owned a camera compared to now. So, with her Box Brownie, Jill’s friend scooped the press photographers who were kept at some distance. Jill remembers that, although the photograph was taken from a long way off, they did catch a closer glimpse of the royal party as the car passed them by. 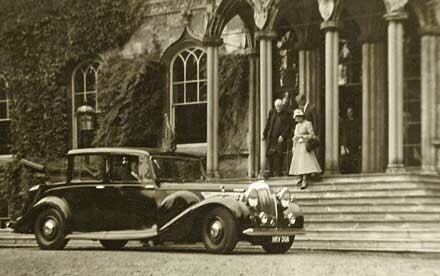 Robin Hill, another resident present at the time, noted in his diary that the line of cars travelled “very slowly both coming in [to the Palace] and more especially on leaving for York”. On arrival at York Station, the couple were met by the civic party before catching the royal train for London. Thanks to Jill and her friend a rare, fleeting royal moment was captured and can now, over sixty years later, be shared with the residents of Bishopthorpe.